Apple reckons its reinvented the stereo, but has it? One of the undoubted reasons for the iPod's huge success is the growth of a so-called "iPod economy", a $1-billion dollar industry that specialises in making accessories for Apple's digital music player. It would seem fair that as Apple effectively created the market that they should want a little slice for themselves. First came the official "made for iPod" branding which nets Apple a slice of third-party revenues, now there's the first true Apple iPod accessory - an iPod Hi-Fi which marries the music player to a one-box speaker system that claims not only to have reinvented home stereo, but to deliver "audiophile" sound quality too. They have a point. Just look at the evidence: the system's three drive units are housed in a single white plastic box. Its 'source' is a digital audio player that's most likely to be stuffed to the final sector of its hard disk with low bit-rate AAC and MP3 audio files. Plus the, ahem, 'Hi-Fi' has a frequency response of 53Hz to 16kHz which is a bit like giving someone a bottle of sparkling wine and calling it finest champagne (True 'music fans' only truck with 16Hz to 20kHz audio). In its favour Apple's engineers have reinforced the Hi-Fi's enclosure with a dual layer skin to increase rigidity and reduce unwanted vibrations. Plus the speaker driver design is proprietary, being specially developed for the iPod Hi-Fi's box. The unit also boasts an incredibly efficient Class D amplifier, although Apple is someone coy about its output in watts RMS. Not to be overlooked is the fact that the iPod is also capable of relaying lossless audio as well as uncompressed music files both of which give the Hi-Fi a fighting chance when it comes to competing with traditional stereos. But first the practicalities. Fetch the Hi-Fi out of its box for the first time and you're immediately struck by its weight - 6.6kg as is, or 7.6kg when fed with the six D-size batteries that act as its alternative means of power. Luckily you can haul the thing around fairly easily using its integrated carrying handles (very Power Mac G5), so it's fine for a spell in the garden, but certainly wouldn't want to lug it down to the park for a picnic. To listen to music you simply drop your iPod into the dock at the top (Apple supplies appropriate adapters for virtually all the different versions it has sold so far), and then select the tracks you want to listen to and how loud you want to actually listen to them using the supplied Apple remote. You can tell that the remote is doing its job thanks to a light on the front of the Hi-Fi that flashes green when a command is accepted and orange when it is not. 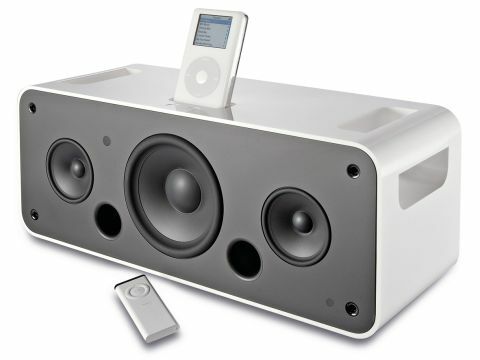 Touch-sensitive volume controls are duplicated on the top of the unit in the front of the dock connector, but for anything more demanding when it comes to control, you'll have to scurry back to your iPod which enables you to tweak the speaker's tone and bass controls, display full screen artwork, etc. To be honest this scurrying back and forth is either a blessing or curse depending on your point of view. If you're the kind of person who just likes to have music on the in background, then selecting the 'shuffle songs' option on your iPod will feed your music habit all-day. Inveterate twiddlers though will find the lack of true remote control of the system frustrating, as will the lack of a video output so you can hook the Hi-Fi up to an offboard monitor. Another frustration is that the speaker settings option only appears on more recent Apple players like the iPod video - our 2G model simply didn't give us a choice. And then there's the way in which the iPod docks into the Hi-Fi itself. While rivals like Monitor Audio's I-Deck and the Bose SoundDock boast handy receptables on the front, your iPod simply perches on the top of the Hi-Fi, making the unit difficult to stick on a bookshelf or to carry around the house without the iPod losing its footing. Then there is the sound quality. Feed the Hi-Fi with compressed audio files and you'll get out what you put in - tinny, slightly brittle renditions of your favourite tunes that deteriorate markedly when the music gets busy or you start to crank the volume. We reckon 192kbps AAC or higher is what you should go for, as this at least gives reasonable results for the most part. But to truly hear the iPod Hi-Fi at its best you'll need to opt for a lossless compression scheme like Apple Lossless codec, or even unfettered CD-quality sounds. Here the iPod Hi-Fi sometimes passes muster. As long as you're not sitting bang in front of it (Apple recommends that you position yourself at least 8ft or 2.43m away), you're rewarded with a reason rendition of your tunes. The Hi-Fi delivers considerable levels of bass weight given its modest specification, while guitars ring out loud and clear. Vocals too sound rich and inviting and there's plenty of treble on tap, despite the lack of dedicated high-frequency tweeters. Having said all this, there's still no way that any sensible person would mistake this for even a budget hi-fi or mini system. The music never really escapes the confines of its box - despite it room-filling sound - and the stereo separation is difficult to define at best. Put on anything stronger than spacey jazz, dance or acoustic sounds and the Hi-Fi's shortcomings are all too clear, the sound become raucous and unrefined, albeit without any distortion no matter how loud you crank the volume. So is the iPod Hi-Fi ready to replace the stereo in your lounge? No, despite Apple's claims to the contrary; but as a second system for a bedroom or study it could do just fine.